When a bishop was reported to have presented his arguments against the Constitutional reform in his homily, netizens reacted in rage for what they deemed was inappropriate. 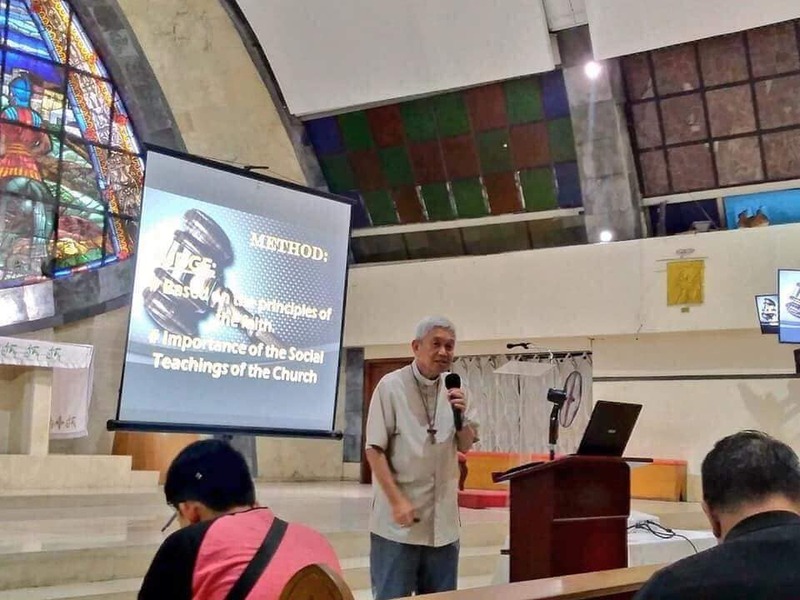 The priest was Broderick Pabillo, which a blog has deemed "the most rabidly anti-Federalism and anti-Constitutional Reform of all CBCP bishops". 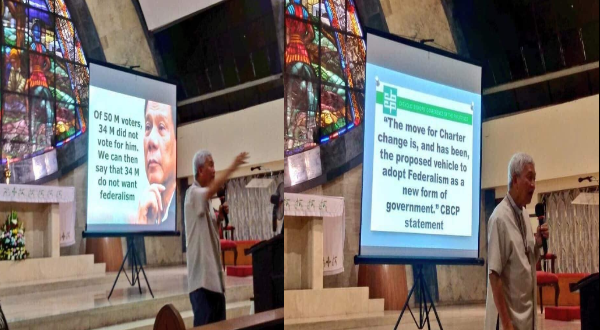 Pabillo was photographed celebrating mass while using a projector to show his constituents his arguments against the constitutional reform being pushed by the administration of President Rodrigo Duterte. Duterte was the subject of his criticisms, with one slide saying "Out of 50.0 M voters, 34 M did not vote for him. 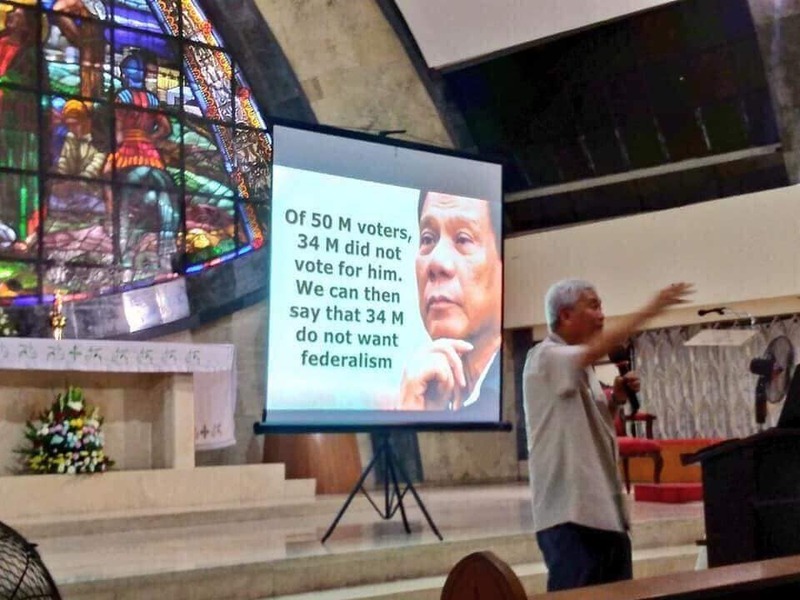 We can say that 34 M do not want federalism." The photoswere taken from a mass at the Makati Parish. The blog which shared the photo, Death Penalty in the Philippines, said, " It’s obvious where the CBCP stands when it comes to trying to fix what’s wrong with the Philippines. Pabillo wants the Philippines to stay lousy, backward, poor, chaotic, dirty, sinful, and corrupt. He clearly doesn’t want any reforms at all." Netizens showed their frustration in thecomments section about the meddling of the church with the country's political affairs. A Rhadz Pantaleon said, "The Government is implementing the NO BALANCE BILLING IN ALL GOVERNMENT HOSPITAL most especially to the POOR... Perhaps the CHURCH can also help the poor by starting...Libreng Binyag, Libreng Misa sa Patay, Libreng etc...You are Champion of Charity works RIGHT????" Lin Ay said that while she is a devited christian, she is annoyed by the interference. "Lin Ay I am a faithful to my church..i was born catholic and will die catholic..but it is annoying to hear politics inside the church..can i atleast hear gods Gospel and set aside.politics?," she said. 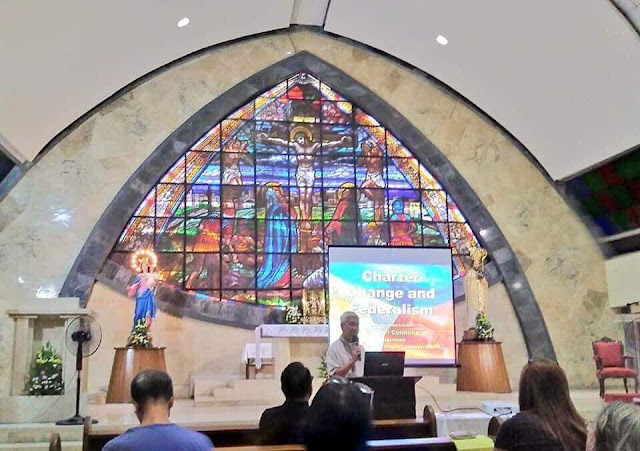 Cindy Ibarrientos commented, "before I used to attending mass in one church, now I am exploring churches where I can find peace and hear Gospels that speaks about the word of God, I am such a busy person finding time for the Lord, and only to hear politics inside the sacred place is such a disgrace, please be enlighten church leaders,we are in need of the Words and teachings of the bible, respect the separation of the church and the state because this can never be equal." While some netizens also defended the church. "Maliban sa Bible at Word of God. Expert na din ang ating Bishop sa pag analyze at disect ng constitutional reform. Ganyan na ang topic sa LOOB NG SIMBAHAN hindi na salita ng Diyos. 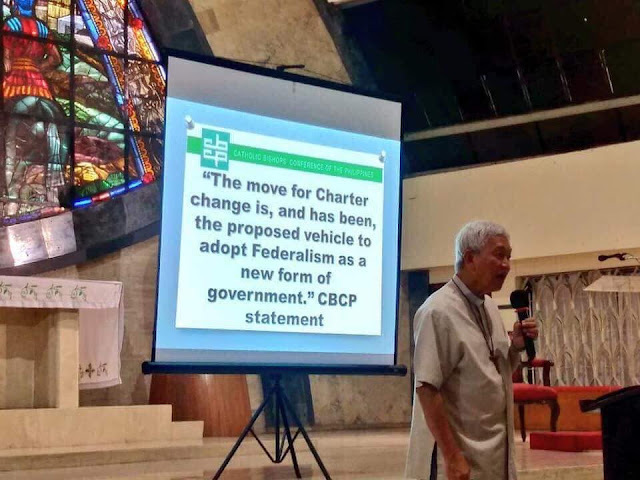 This is Broderick Pabillo, the most rabidly anti-Federalism and anti-Constitutional Reform of all CBCP bishops. It’s obvious where the CBCP stands when it comes to trying to fix what’s wrong with the Philippines. Pabillo wants the Philippines to stay lousy, backward, poor, chaotic, dirty, sinful, and corrupt. He clearly doesn’t want any reforms at all. These were taken from the Makati Parish of my good friend who grew up in that parish..."